The Carex Large Base Offset Handle Quad Cane is fully adjustable and offers added stability over standard canes. It is silver in color. 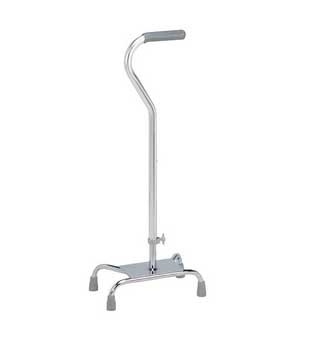 The Carex Large Base Quad Cane is height adjustable from 29” up-to 37”. It is ideal for people that are independent enough to use a one-hand walking aid yet want the stability of four floor contact points. The large Base Offset Cane features a large base for increased stability and balance. It is adaptable for right or left handed users. Height adjustable from 29" to 37"